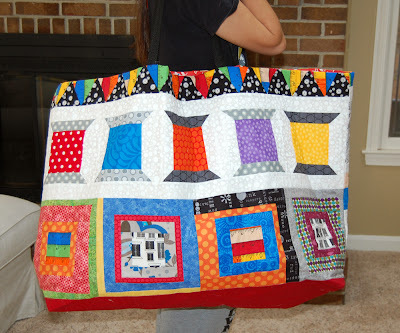 At the same time I was dreaming about a tote bag, this quilt top has been hanging around. It was from the guild's Row Robin that ended in December. 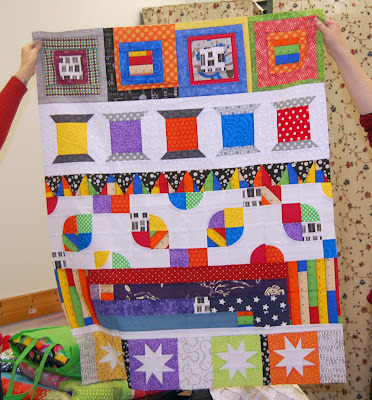 I envisioned a sewing themed wall quilt, and made my starter row some colorful spools. My fellow "robiners" did a great job with my top. But when it was all done, I just wasn't feeling a quilt. And then it occurred to me I could make the top into a tote bag. So I took it apart in places, did some rearranging, added some solid red to the bottom and came up with this really ginormous tote. I LOVE IT! It's about 35" wide, 25" tall and 8" deep. It holds everything I want and then some. I layered the outside with some thin batting, did some minimal horizontal line quilting, then fused a stiff interfacing to the outer layer and the lining as well. The lining is a favorite vintage sheet in an awesome red print (never seen before or since.) I already have it stuffed to take to our next guild meeting. I know this will get tons of use. 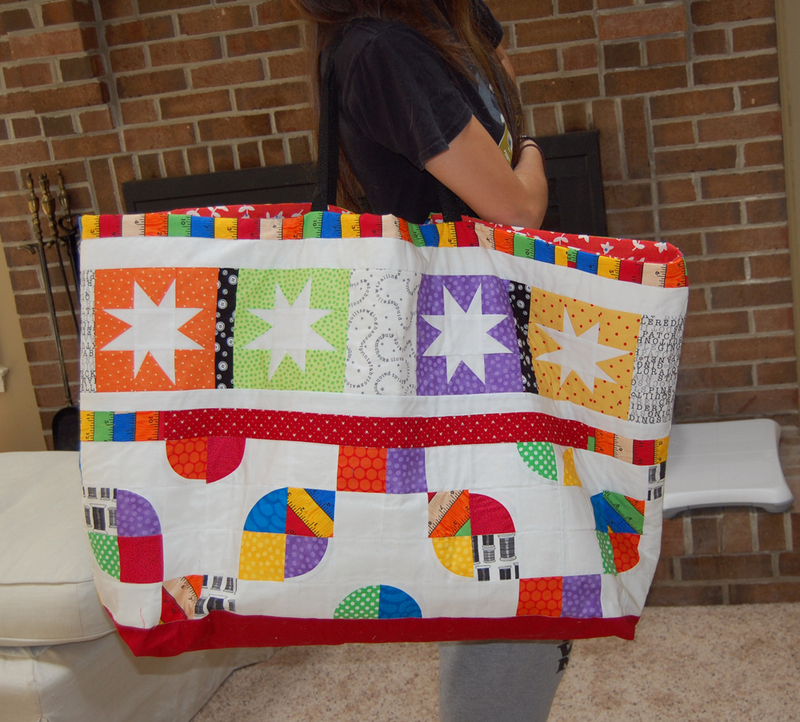 Filled with 2 quilts and a 20" pillow! Great tote bag! So inspired to see you repurpose the row-by-row quilt top into the tote bag. 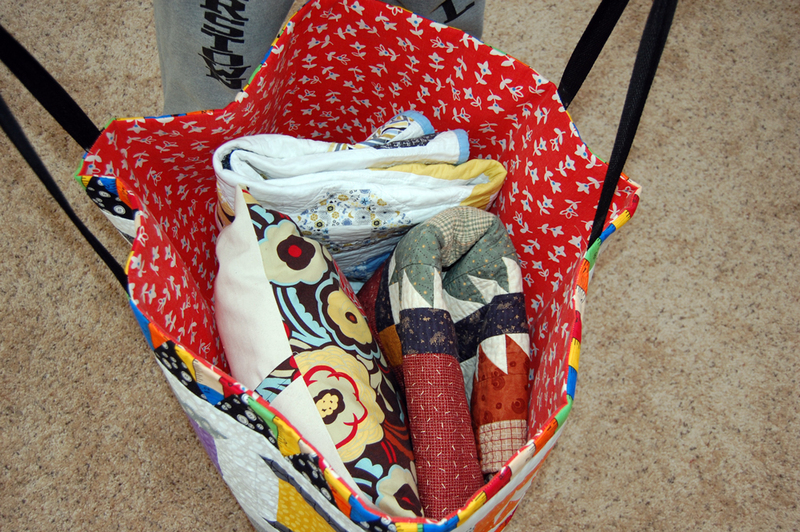 I agree with Brenda--I may have to make a tote for myself! Super Great Colors Patterns and Fun size too.